The CFMC oversees and collects donations in grants and contributions on behalf of individuals and charitable organizations–Tom calls these dedicated funds “buckets.” The Foundation then oversees the distribution of those funds for their intended purpose. The CFMC also oversees the Kendrick Foundation Scholarships, established in 2001 from the proceeds of the sale of Kendrick Hospital and awarded annually to Morgan County college bound students pursuing health care-related degrees. Tom estimates that this year, the Kendrick Foundation will award scholarships to 41 students, totaling up to half a million dollars, plus an additional $1M in grants for medical-related projects to benefit the county. For students, combined with two Lily grants and a grant created by the Foundation, the foundation will award up to $1M in scholarships this year. The amount has increased every year. 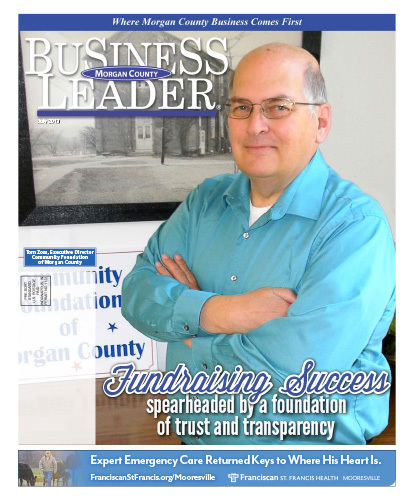 When Tom came on board, “The total grants and contributions from the county ranged around $100,000-$200,000 per year. We weren’t in anyone’s will. Nobody was soliciting the community for planned gifts. That was our future. Download the full July 2013 Edition here.